Canadian Singer Justin Bieber, who will be performing today at the most awaited concert in India, has an avid interest in boxing and is a boxing contender himself. Bringing to the fore this facet of his personality, India's only and renowned miniature painting artist, Suvigya Sharma unveiled a lifesize portrait, he commissioned for Bieber and presented it to him today at St. Regis in Lower Parel, Mumbai. Suvigya said, "I am really glad that Justin is happy seeing the painting and he really loved it!" Suvigya Sharma is an Indian artist, painter, fashion designer, does miniature paintings, Tanjore paintings, fresco work and portraits. The art which he pursues is perishing and has a long history of over 2000 years attached to it. He's the third generation artist and has commissioned artworks for a majority of industrial & celebrity families in India and the world including most prominent names like Honourable Prime Minister Narendra Modi, the Ambani Family, Mrs. Rajshri Birla, Binanis, Singhanias, Burmans, Piramal family, Sachin Tendulkar, Priyanka Chopra, Rani Mukerji and Kangana Ranaut. The Artwork is a life-size Oil on Canvas Portrait done in a miniature detailed portrait genre of painting, which the artist is popular for. It is a portrait done in Monotones, a mix of black & white color, the combination has made it hyper-real. "I am sure this artwork will be loved by all of Justin's fans worldwide, it being a masterpiece in itself. 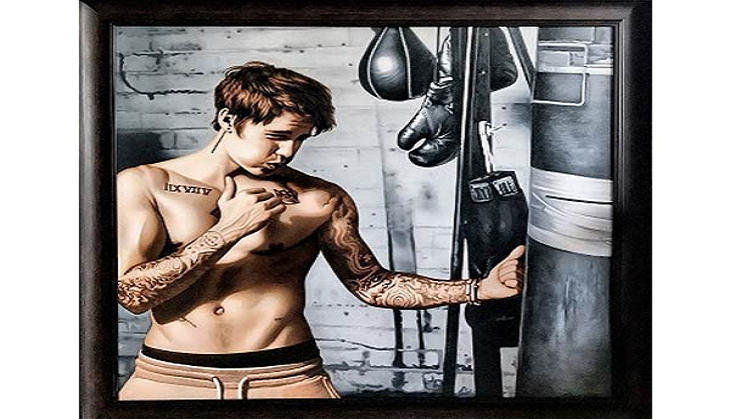 Justin is really fond of boxing and this portrait is dedicated to his love for the sport," added Suvigya. handmade memento - a custom-made gold-leaved and gold-embossed bat with a 24 carat gold handle at the opening of his show The Art of Royals.